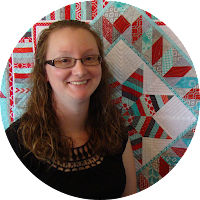 I started this blog for several reasons, but one was to record the stories behind the quilts that I make. 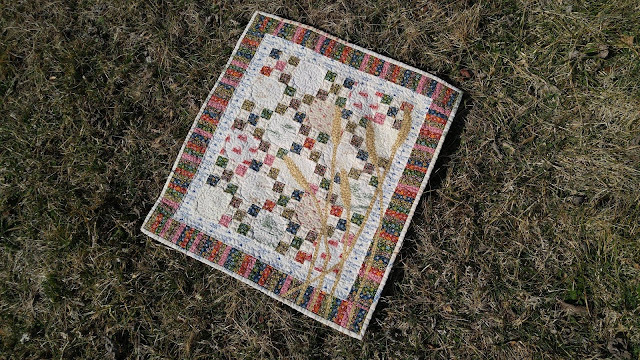 This quilt wrote its own story! 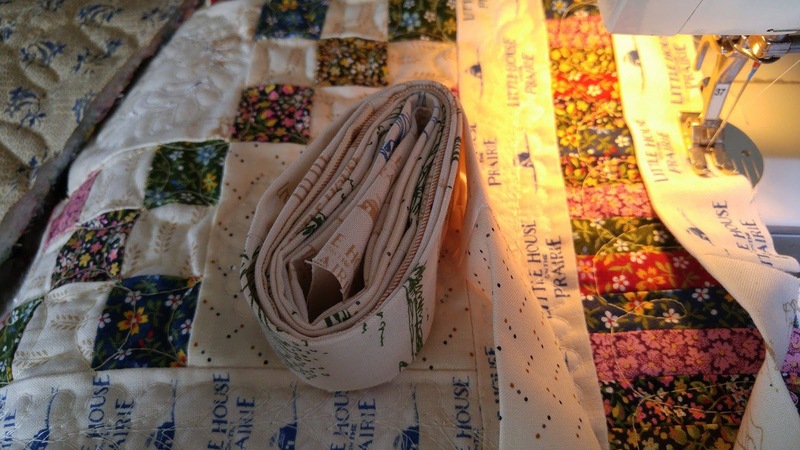 Before Christmas 2015, I won a giveaway on Instagram for some fabric scraps. 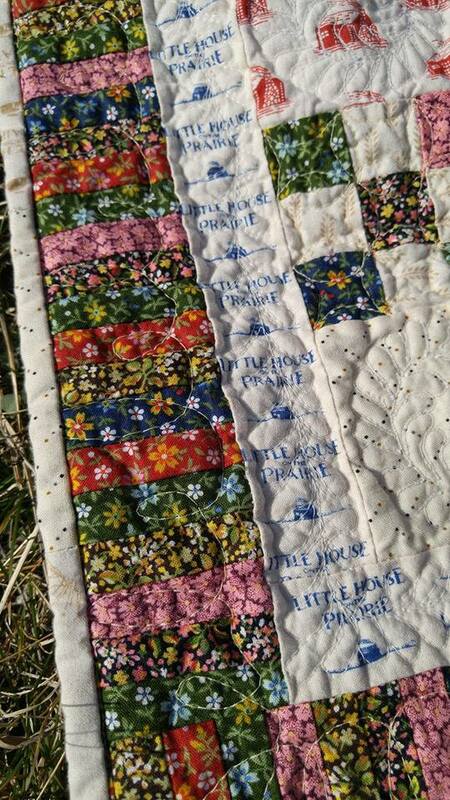 The fabric was the just released Little House on the Prairie line by Andover Fabrics. 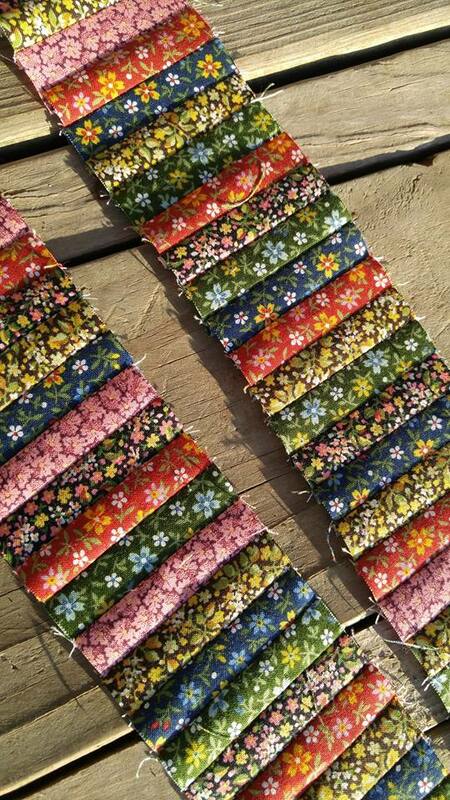 The scraps were from Kerry Goulder (@kidgiddy on instagram). 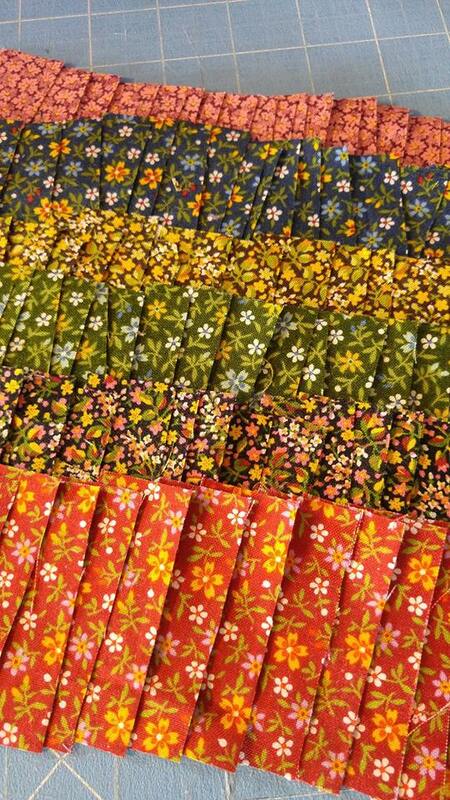 She had just finished making dolls for the Andover booth for Fall Quilt Market. Several of the actresses from the Little House on the Prairie TV show were there to promote the new fabric. When I received the scraps, I realized they were just that. Scraps. 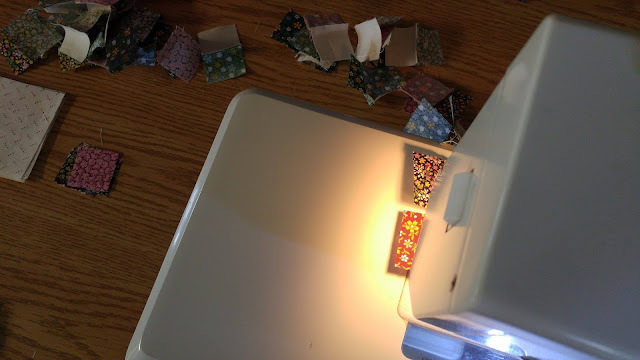 Most of which were quite small and oddly shaped from making dolls. I set them aside not knowing what I would do with them. 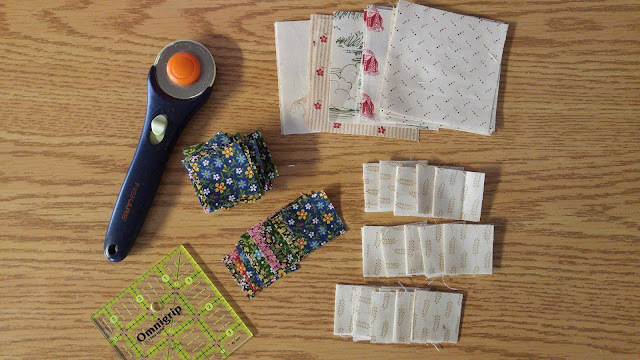 That was just the motivation I needed to revisit those scraps! 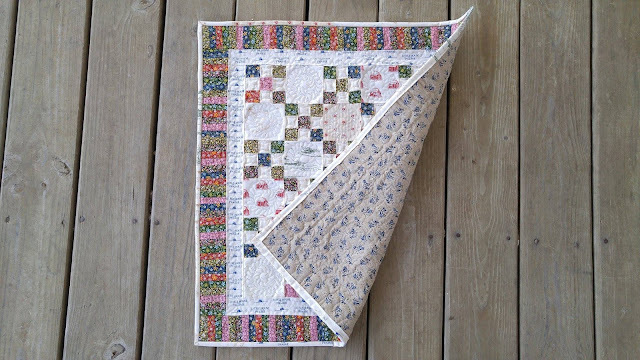 Based on the sizes of scraps I had, a doll quilt would be a great size to aim for. 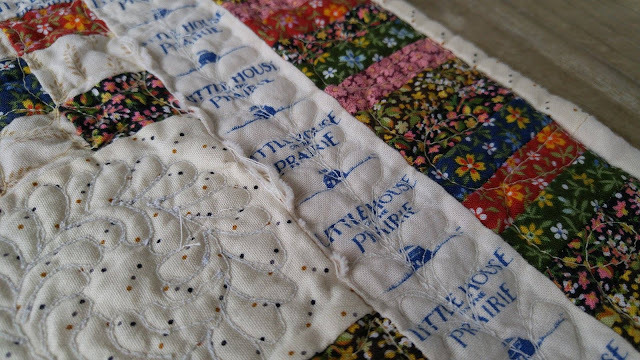 I wanted to choose a design that was more traditional and appropriate for the Little House time period. I was able to cut 3 1/2" squares out of the neutral fabrics. 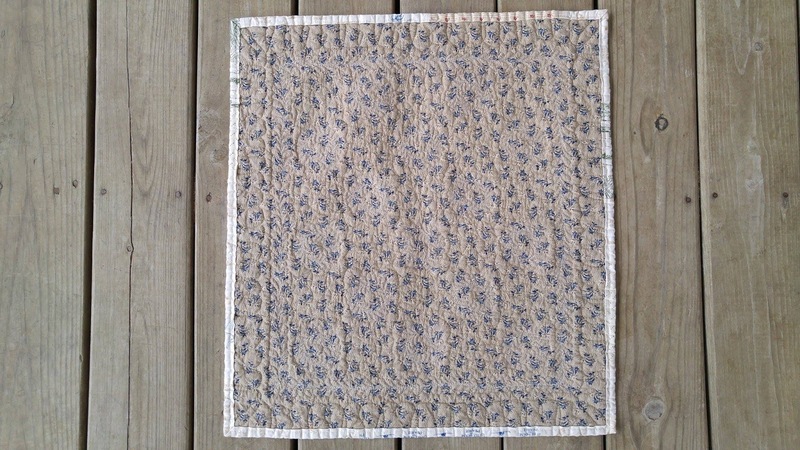 Then I cut 1 1/2" squares out of the neutrals and the darkest prints. 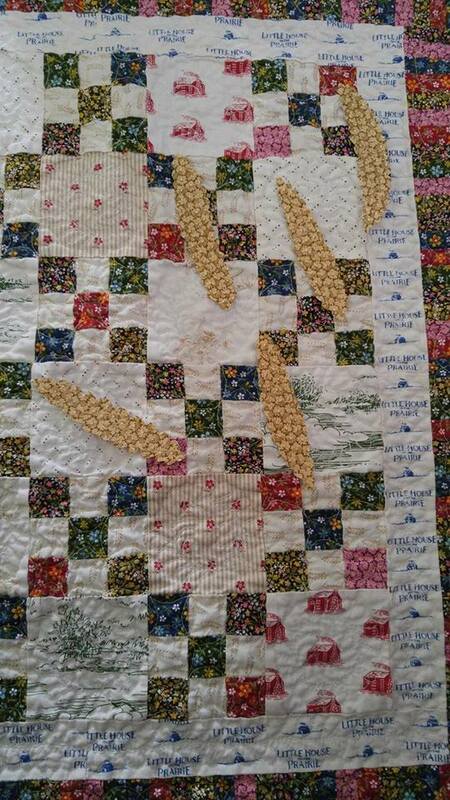 I sewed them into nine patches and arranged them in an Irish Chain layout. 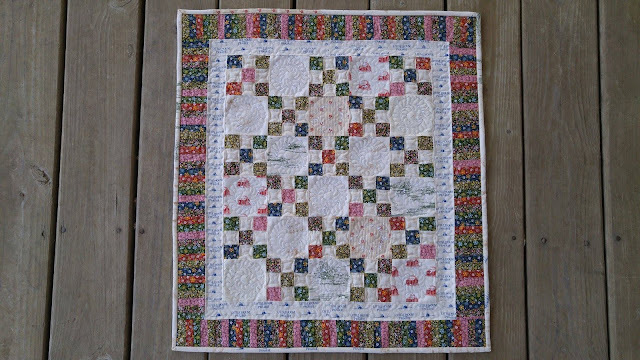 The squares finished at 1". 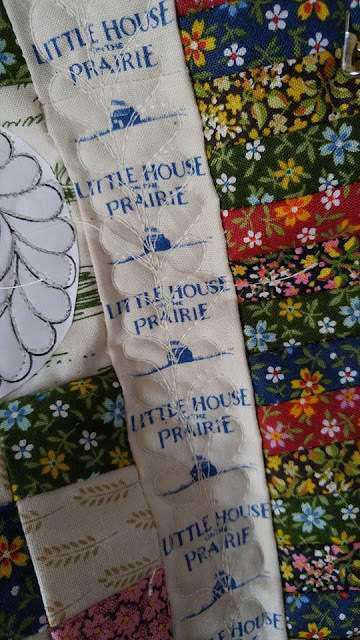 I had "just enough" of the blue Little House print for a border. Then I sewed 1" x 2 1/2" strips together to create the outside border. 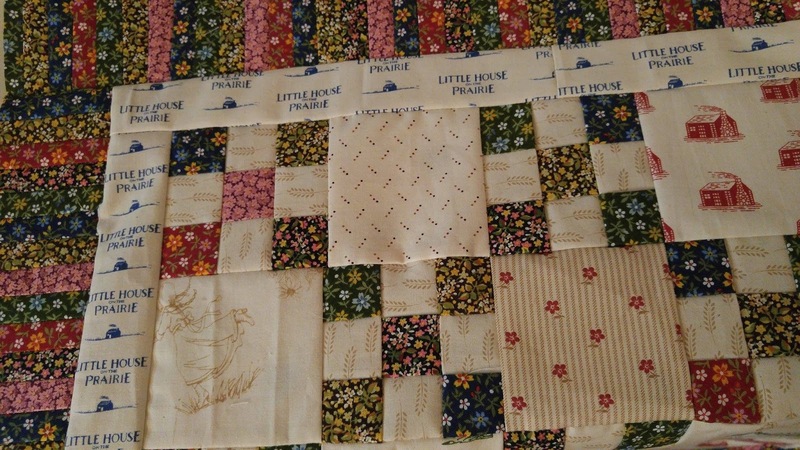 The border pieces finish at 1/2" wide. I did not have enough fabric to make a back, so I used a piece of fabric I got from my grandmother. 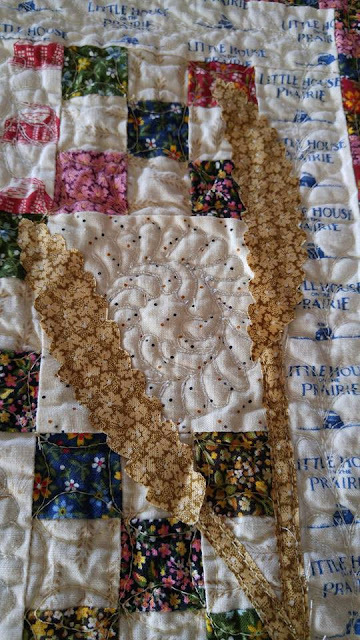 She was selling it at a garage sale for $1. As you may already know, I love to try new things with each quilt I make. 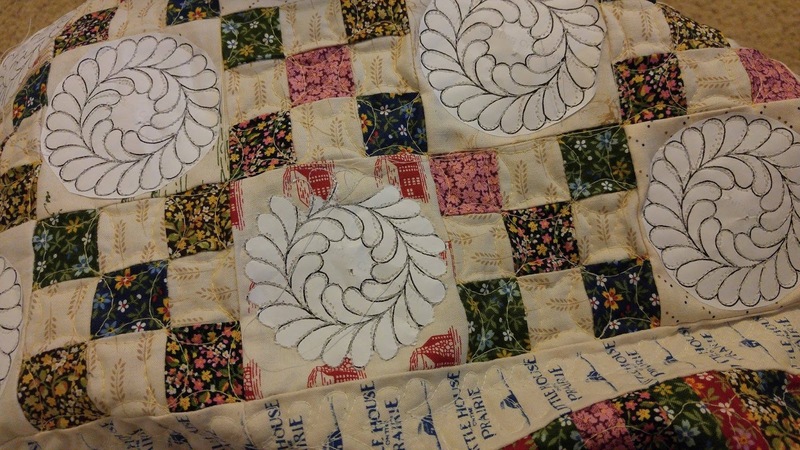 So I wanted to try new (to me) quilting designs. Staying true to the traditional quilt layout, I chose a circle of feathers for the neutral blocks. 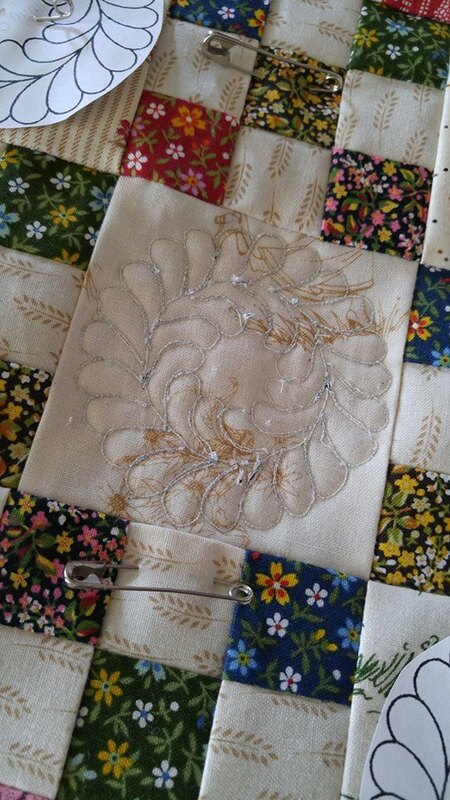 I also did a corner to corner curve in the nine patches, feathers in the neutral border, and loops in the outer border. 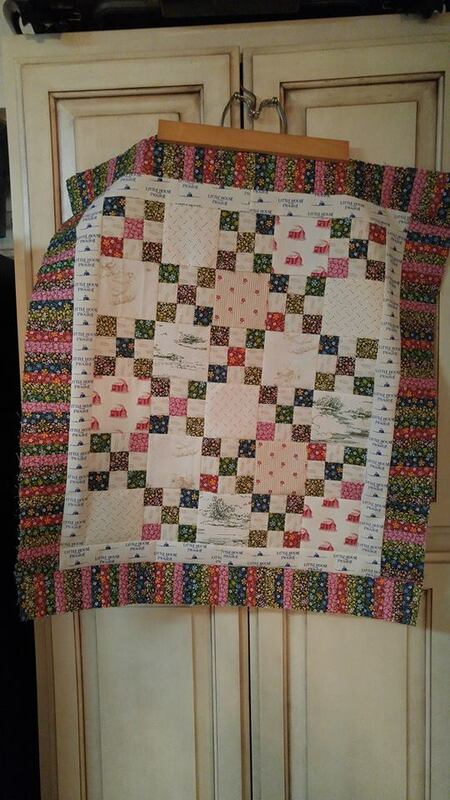 All quilting designs I had never attempted. Instead of free-handing the designs, I decided to print the design and quilt over it. This would help me to be accurate and get better results. 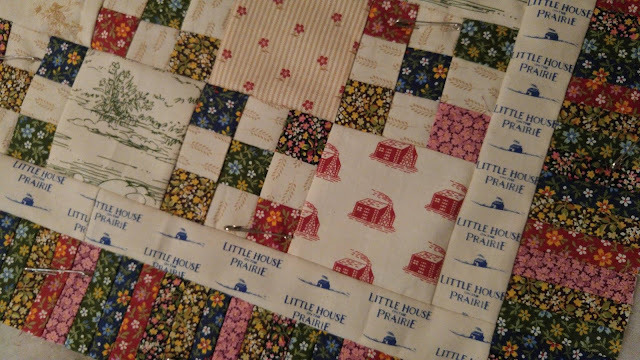 Remember, these blocks finished at 3". The spaces are tiny! 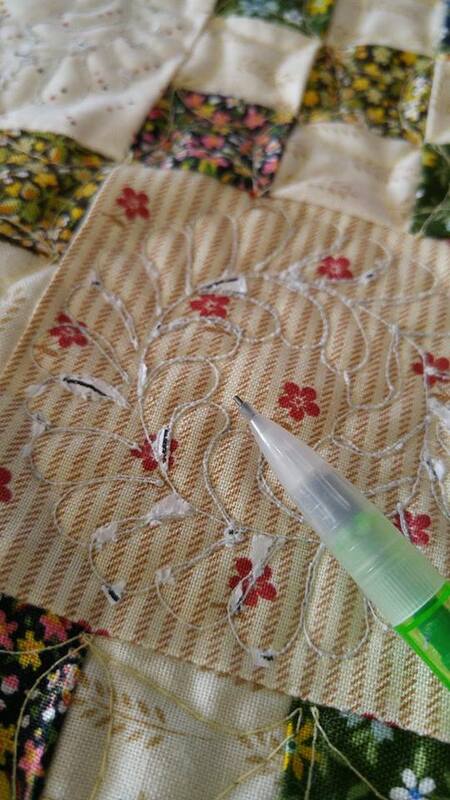 And once stitched over, the paper had to be removed one tiny piece at a time. 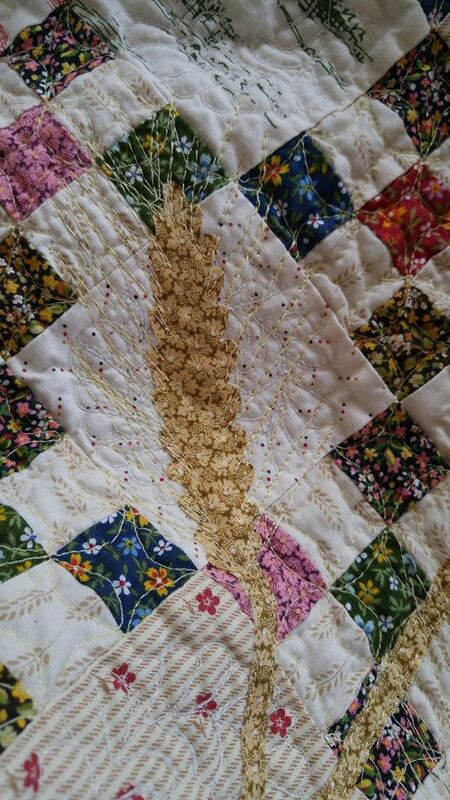 I removed the paper as best I could and decided that I would wash and dry the quilt once finished to help remove the tiniest pieces. 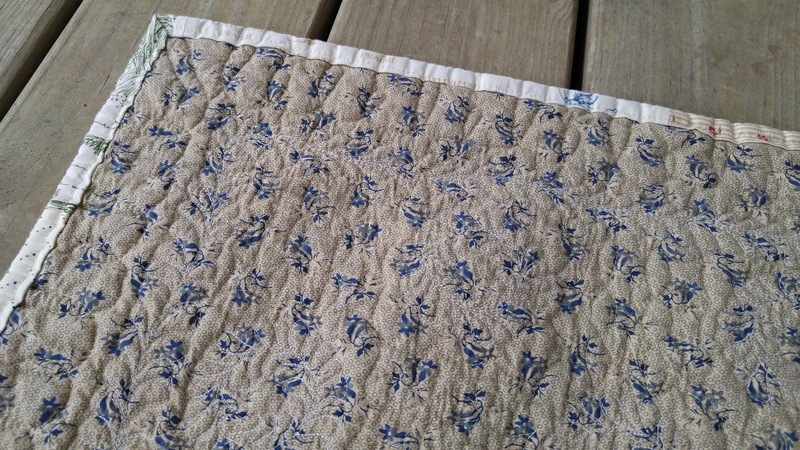 While quilting the outside border, the backing fabric got folded under and I had to un-sew an entire side and redo it. 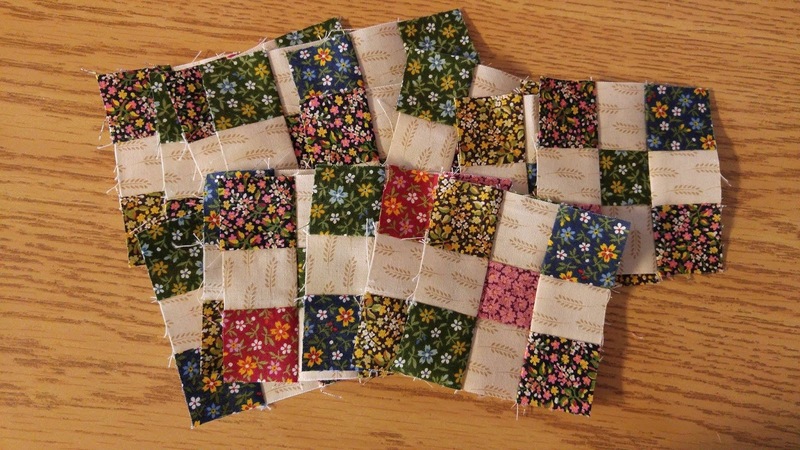 In order to make the binding, I had to piece together many neutral scraps. 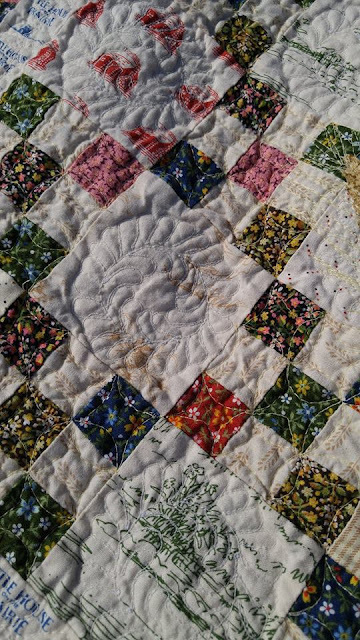 Once finished, I tossed it in the wash. Before putting it in the dryer, I removed all the tiny bits of paper still stuck in the stitches. 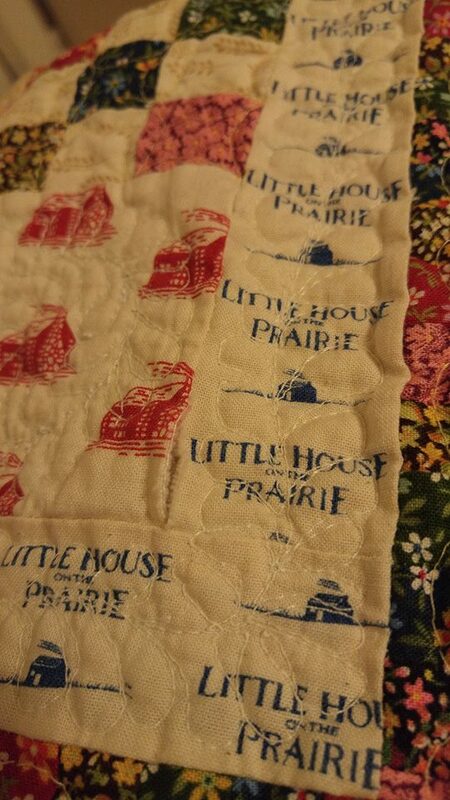 I was so excited to get it out of the dryer! 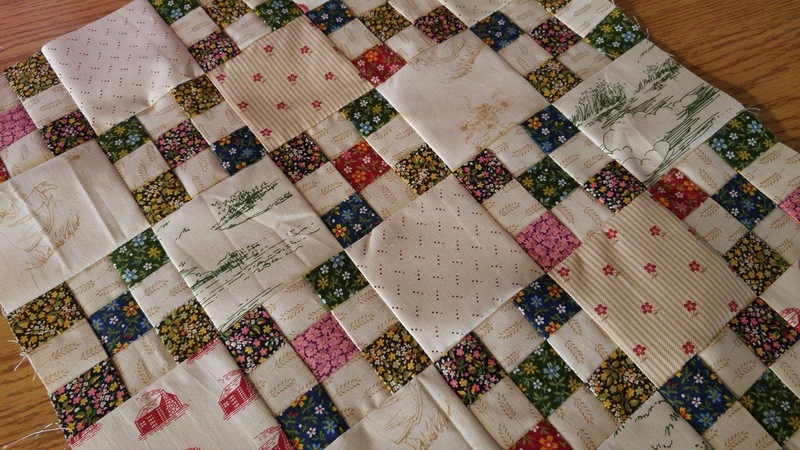 Have you ever had a quilt tell you it wasn't done yet? 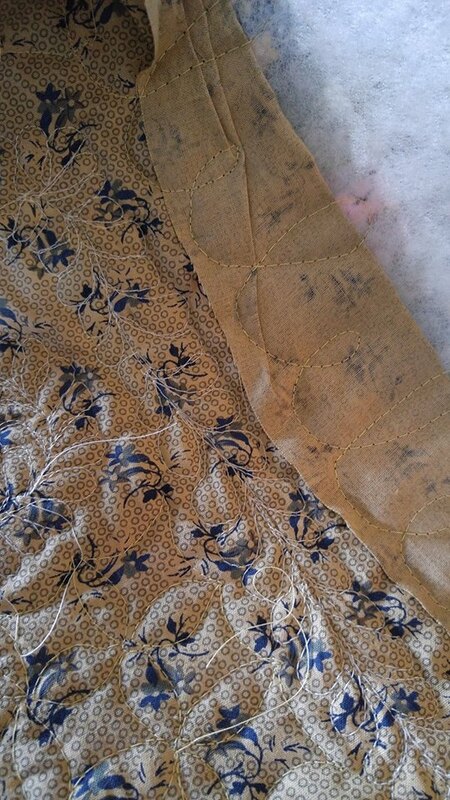 I had used a smaller than normal seam allowance for this vertical seam because the fabric strip was just not quite wide enough, but I wanted to use it anyway. 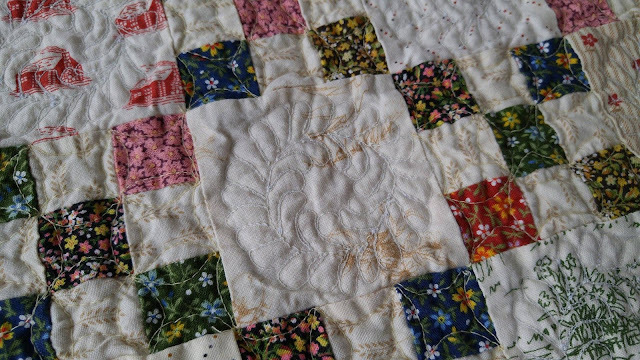 The seam had come apart in several places all along the length of the quilt, and the fabric had frayed in the dryer. I was beside myself. There was not enough fabric to re-stitch it down. There was not enough fabric to iron it down with an adhesive. 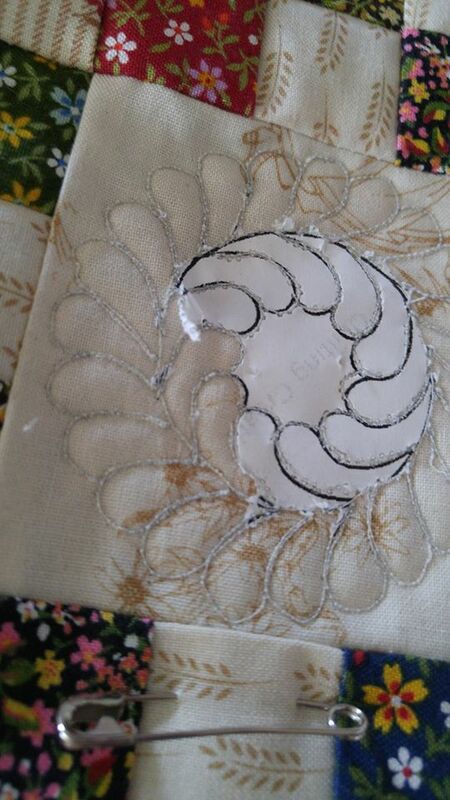 The only solution was to applique over it. 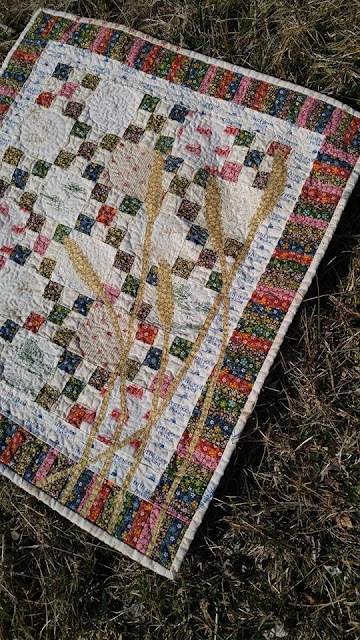 I immediately decided on wheat, but slept on it to make sure that's the direction I wanted to go. 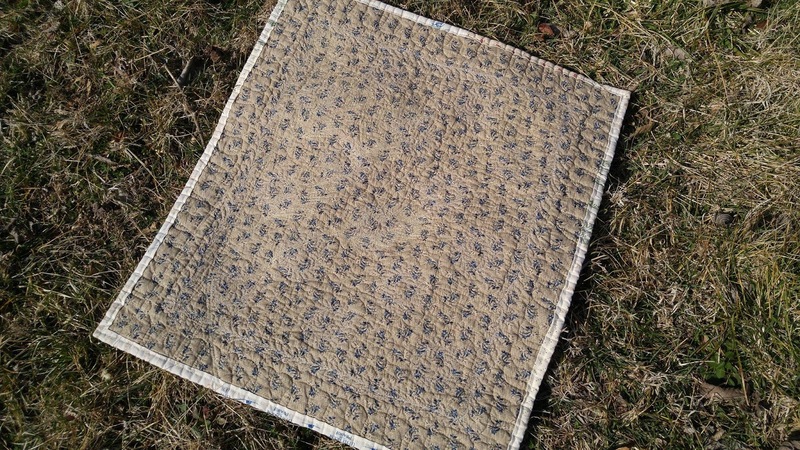 There was one fabric that would be best to use for wheat, but I had very little of it. Several pieces were less than one inch wide, many only 2-3" long, and all had curved sides from doll parts being cut from them. I ironed Heat-N-Bond to the back of some of the pieces and used scissors to cut heads of wheat. I just free-hand cut a design that looked similar to images I found on Pinterest. 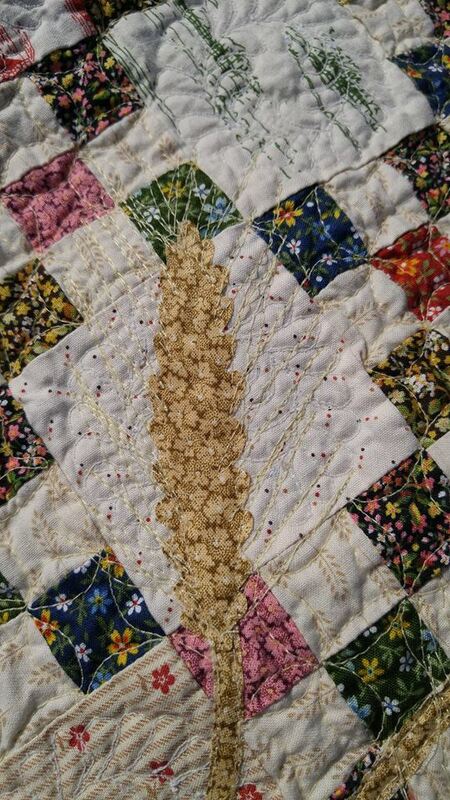 I fused the wheat heads down, but left the bottom 1/2" unfused. Then I used the longest scrap pieces to cut 1/4" wide wheat stems. 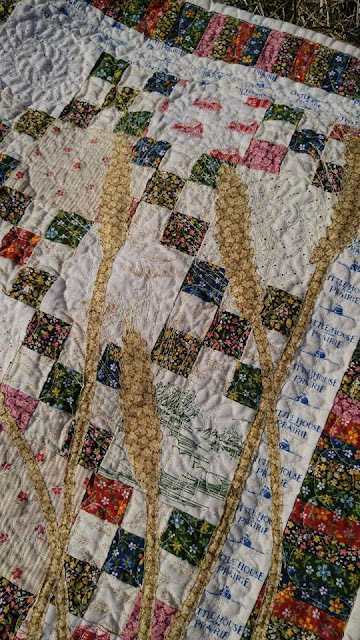 I tucked the edge under the wheat head and stitched down both sides of the seams. I overlapped a new fabric piece when needed and just continued stitching. 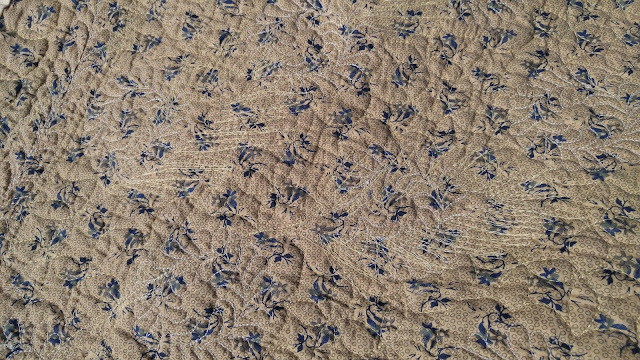 The shape of the stems was mostly determined by the shapes I was able to cut from the fabric scraps. 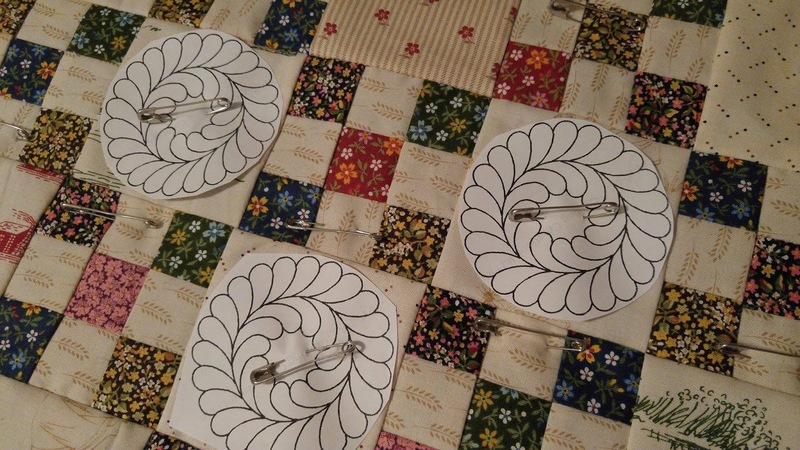 And the holes that needed to be covered. I then used my free motion quilting foot to quilt the "spikes" of the wheat (pretty sure those are called awns). 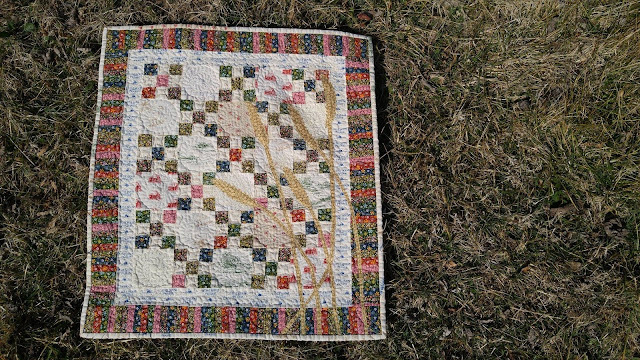 Trimmed threads, and it's done! For the second time! 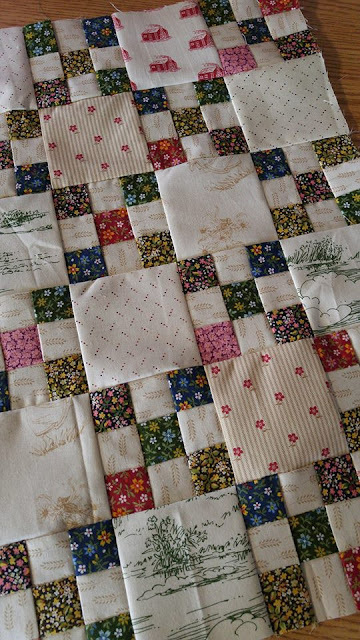 In the end, I'm very happy with the new quilting designs I used. 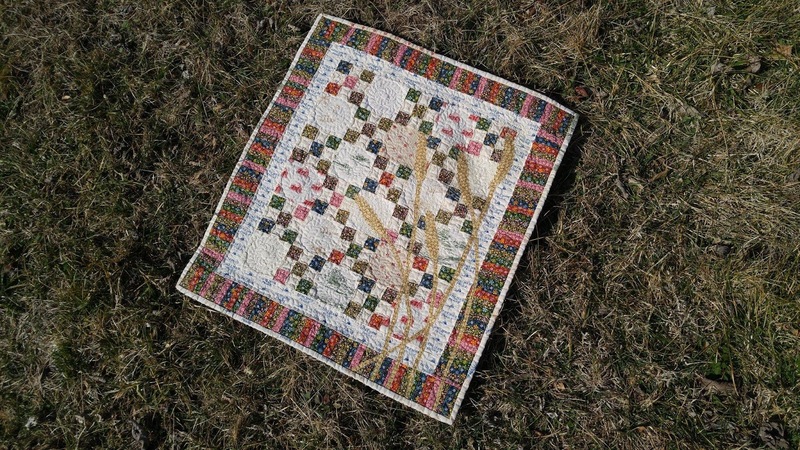 I also like that the wheat applique adds a focal point and something different to the quilt. 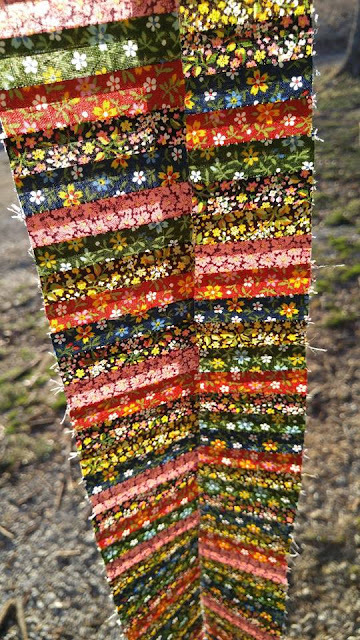 The fabrics are more traditional than I typically use, but I like that it stretched me to try new things. The quilt turned out a little larger than I had planned. 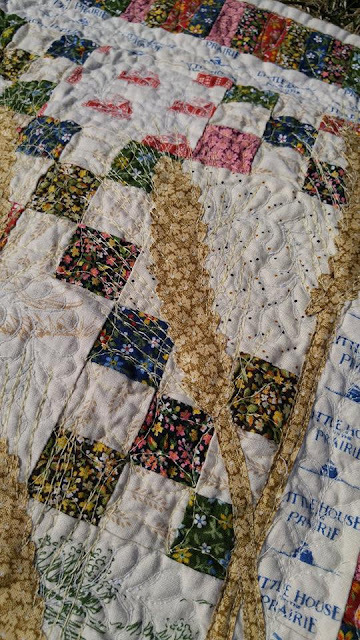 I'm sure it could still work as a doll quilt. 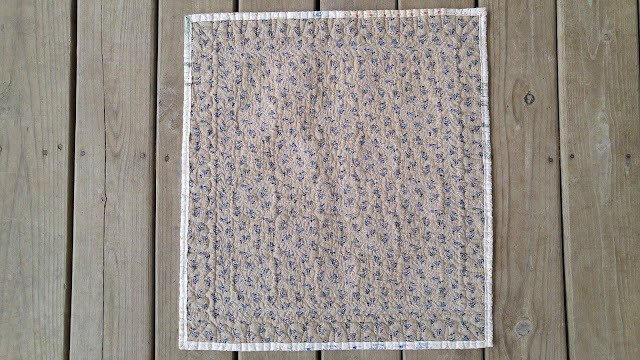 It finished roughly 21" x 24". The contest was supposed to end March 1st. However, there were few entries and it got extended until March 15th. Then out of the blue five days before the deadline, I had an epiphany. 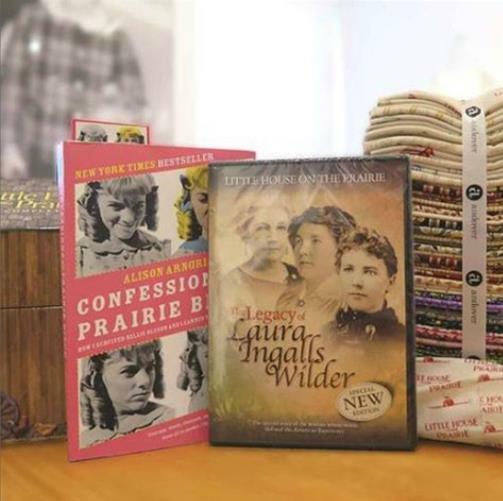 We live thirty minutes from Laura Ingalls Wilder's home! The quilt needed to visit! 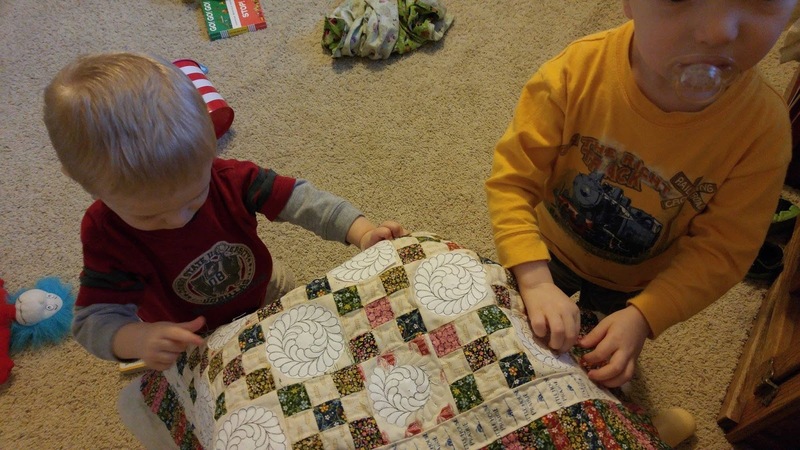 You know the feeling you get when you see your quilt being used by the recipient? This was that moment. 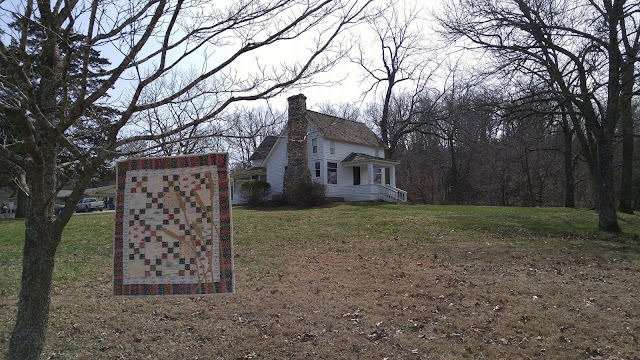 It was a beautiful day and the most perfect place to photograph this quilt. 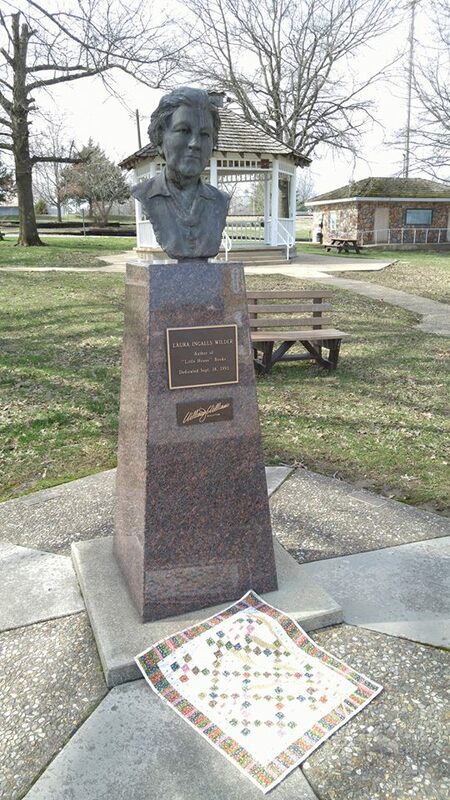 There is a bust of Laura Ingalls Wilder in the Mansfield town square too. Of course I had to show her the quilt. Is the quilt's story complete? I'm sure it is not! Andover Fabrics announced the winner of the contest this morning - and I won!!! Look at the prize package headed my way! I'm still in shock! 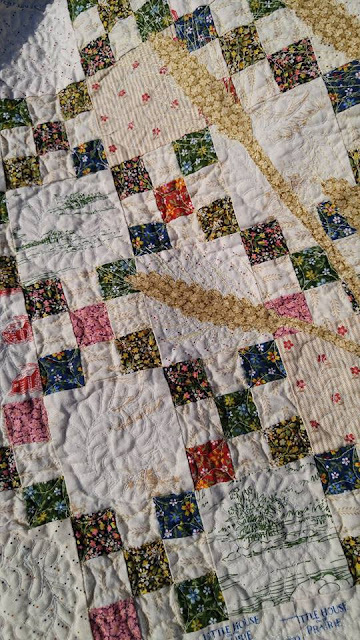 Check back, I'm sure this quilt's story has much more to come! 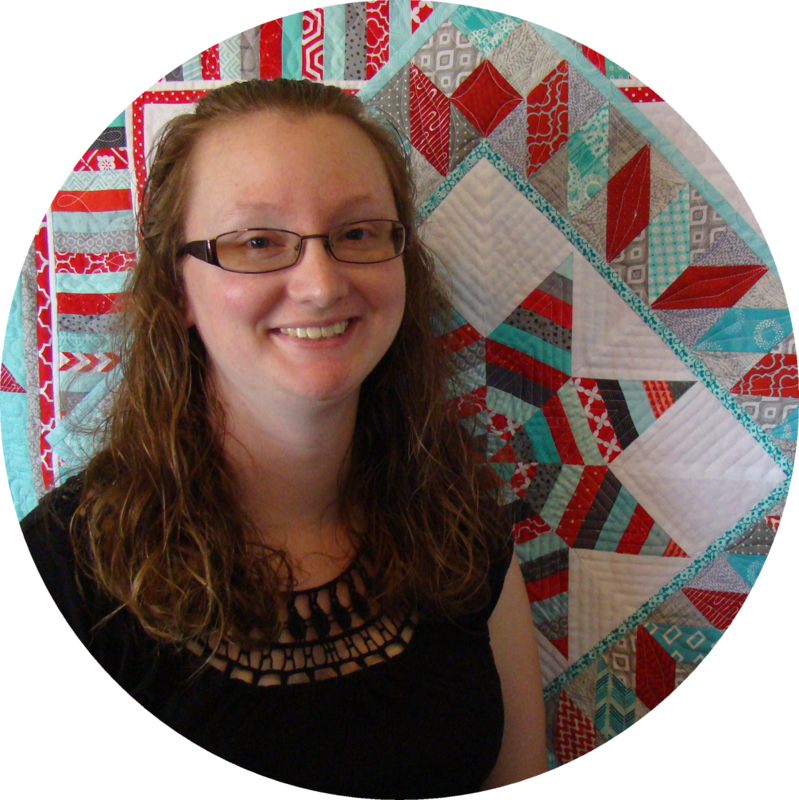 Find me on Facebook at Slice of Pi Quilts and on Instagram as @sliceofpiquilts. Looking for the Little House on the Prairie Fabric? Start here. 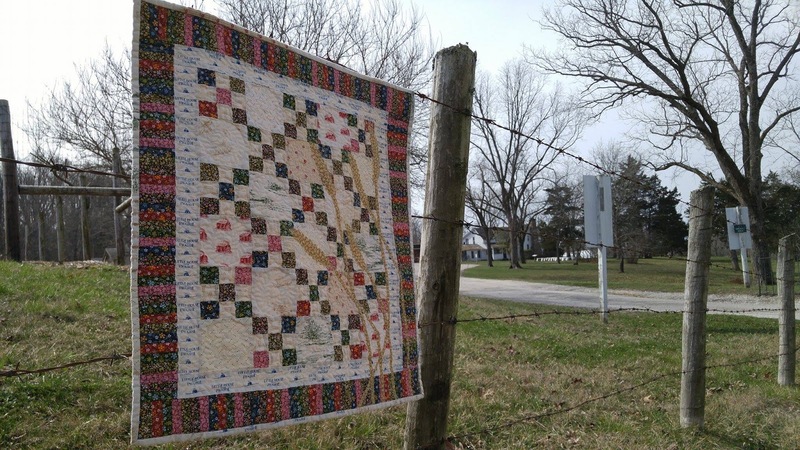 Love your quilt and hoping you were a winner. Congratulations. 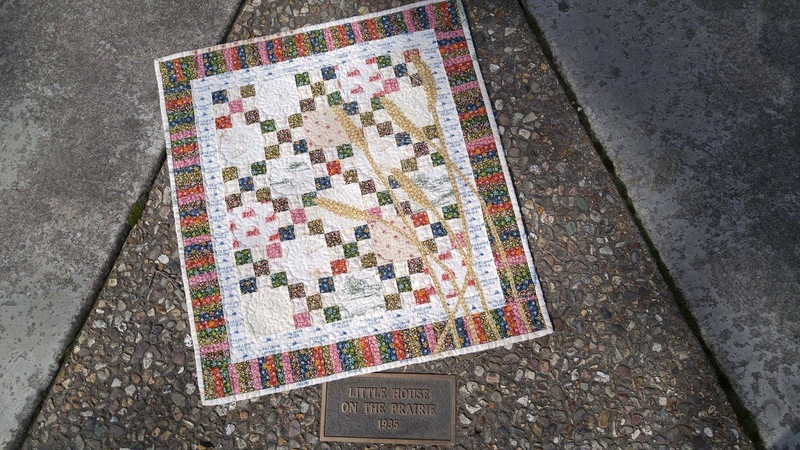 What a beautiful quilt and what a story. 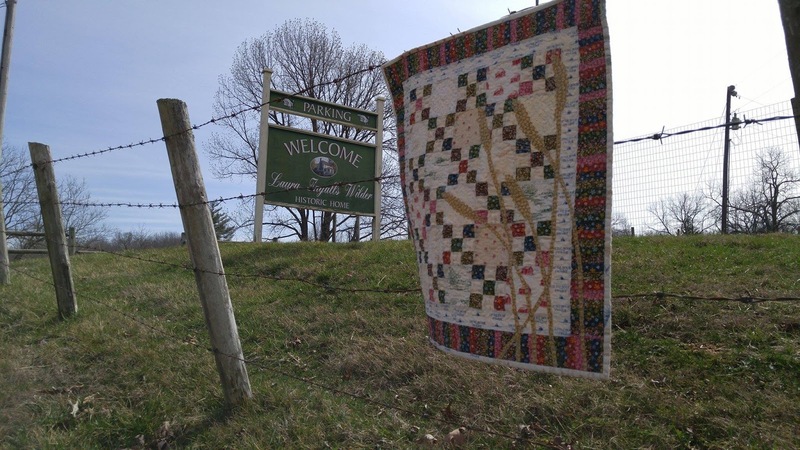 I love the fact that you took it to Laura's home it adds so much more to the story. 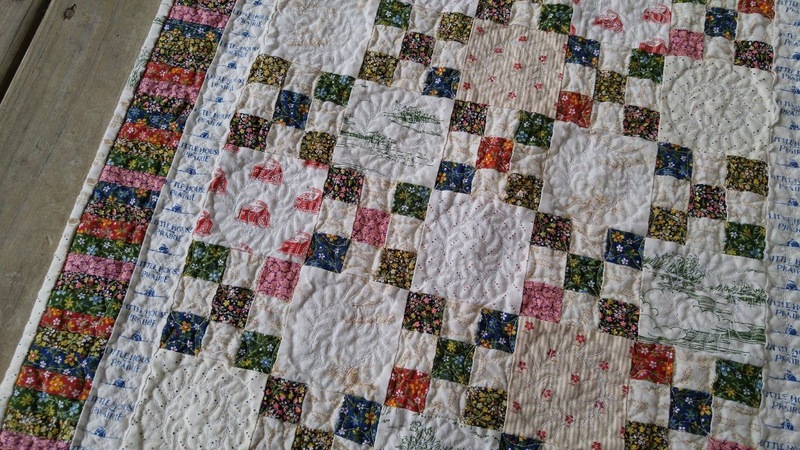 I think you are a daredevil by putting a quilt in the dryer I would never dream of it. 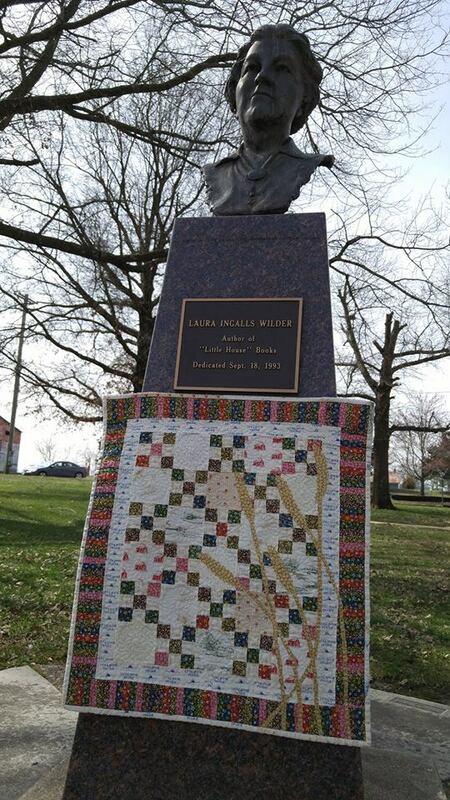 You dealt with your predicament in the same spirit that Laura would have. I think your solution was nothing short of brilliant! 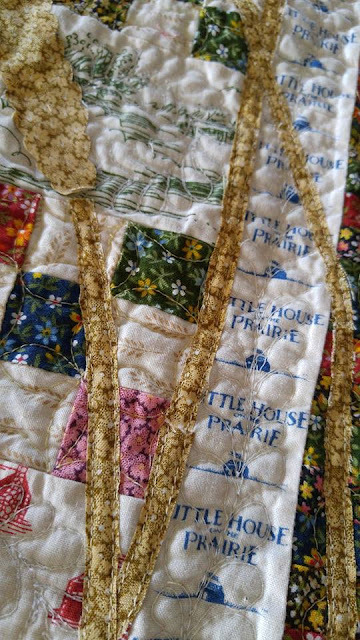 Also loved your idea to photograph it at her farm. I love your story of the quilt. My hubby got to go to Minnesota and while there visited may of the sites. I want to go and you know what, they are still my favorite books. Need to read them with my granddaughters.